The Official website of Steve Hudson’s Voice Master. 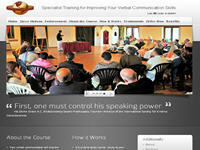 It offers a wonderful course for improving your verbal communication. Category Stores and Shopping May 10, 2013 by ISKCON Desire Tree.